Ok. It's another Canadian summer long weekend. More time to pause and reflect. When I started out to draft this blog entry, I thought there would be three or so more things to comment on. Turns out there were 10. Sorry. 1) A place for everything and everything in its place. Hot bunking is when you share a bunk with someone on the opposite watch. In a confined space and in these circumstances, this rule is essential to follow. I wanted to overcome my major challenge of the previous leg, which was to find the right place for everything and then find a thing when I wanted it. I think I mastered it on my second leg, almost from the start. Rare was the time something went missing for a few days before turning up again. And I only lost one pair of reading classes - my spare, so it was ok.
Actually the "roof" is on a slant, and I am flat in my bunk, with the bunk raised on one side and the lee-cloth up so I won't fall out. Now, where did I put my reading glasses? I experienced the obvious benefits... relatively efficient routines for going on and coming off watch, more time for much needed brief periods of rest and recreation, no wasted time searching for things, being focused on the important things and not distracted by lost items... I will be more diligent with following this principle in my daily life. 2) Reflective writing is a pleasure. I tend toward introversion more than extroversion, so blogging publicly was a push for me. Like journaling, it helped me to more deeply process my experience and anchor memories. 3) Rest and relaxation is important. I soaked up natural beauty, explored music, read new authors, chatted with crew mates, learned about the world. I became relaxed and felt good in a deep and almost constantly smiling way. I need more R & R to be my best. Relaxing on deck while off watch, sitting on the staysail, trying to beat the heat down below. A bit of breeze and cloud cover a welcome relief. 4) I'm one of those people for whom spending time in the outdoors and paying attention to nature is nourishing to my soul, helping me feel centered, settled, content. Not making time for this is soul crushing. What nourishes your best self? Spend more time doing it! 5) This experience reinforced for me in a big way that I love working towards a goal that I perceive to be meaningful as part of a committed and well-functioning team. 6) Diversity works! This group of diverse people made a winning combo when it came to racing! Diversity was a key team characteristic from which many helpful team habits developed. (See earlier blog). Smiles and laughter at meal time. 7) Slow and steady wins the race. As a woman of my age, though reasonably fit, physical strength is not an outstanding characteristic I can bring to the team effort. Yet, I could participate fully in managing heavy sails and meeting the challenge of the great forces of nature through mechanical leveraging and teamwork. Those who were stronger and faster accommodated those of us needing a more steady pace, since all hands on watch were needed to manage the heavy lifting or grinding. We were not always fast, but we were certainly effective. And since brains accompanied braun, we didn't break stuff through applying brute force. I must remember to take the time to be inclusive of others for best results. Ryan and I making wraps, as near to naked as we dare in the 40+C degree heat - Do we really have to bake bread? No oven on, please!!! 8) Unnecessary toil and unnecessarily harsh living conditions wear people down unnecessarily. It's difficult to perform at one's best and always do the right thing, and to keep a positive attitude. For example, on the Clipper boats, there needs to be better airflow down below, easier bilge management methods, lazy jacks to make flaking the mainsail a thousand times easier, etc. Heat exhaustion, skin rashes and dehydration were constant burdens. Flaking the mainsail after racing and publicity sailing events was an unbelievable waste of time and effort, requiring all hands for an inordinate amount of time. 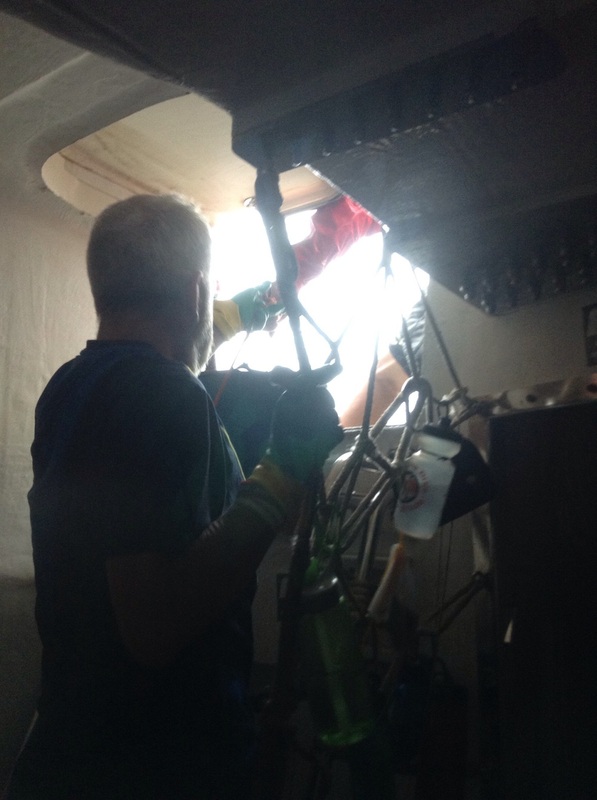 Adrian, rubber gloved, passing a bucket of bilge water (from below the floor boards) up through the companionway hatch. Grateful it's calm. This makes me think that living in extreme poverty conditions must be terribly difficult to lift oneself out of. I've understood this cognitively, but I think I have a little more understanding now. Post knee injury with make-shift brace. Sitting in the foulies locker near the companionway entrance down below hoping for a bit of breeze. Whew! So00000 hot!! 9) I also progressed in my understanding of issues faced by people living with disability. When I got back on the boat for Leg 7, I wore a very obvious mega red and black leg brace whenever I was not in my bunk. Weather permitting, which was most of the time, I wore shorts. So everyone saw the brace and knew about my mishap on Leg 5 when I ruptured the ACL (a ligament providing joint stability) in my knee. After a month of intensive knee rehab (Julia, my PT was over the top fantastic), I was good to go, medical clearance and custom knee brace in hand. I had tested things out during a 3 week sailing stint in Antigua and was delighted to find I was 100% functional and not the least bit encumbered with the brace. This proved to be true in the more challenging sailing conditions experienced on the Clipper Race Leg 7 as well. Hurray! Stem to stern, I could do it all. Most crew silently observed my mobility, or ignored the brace altogether as far as I could tell, and some later commented, saying things like, "you seem to move around really well." It seems, understandably, they must have been doubtful, or at least questioned whether I could get around the boat and do the physical work required. But my watch leader, at least initially, was cautious about assigning me duties on the bow, where the action can get quite intense and physically demanding. I challenged him on it, and he said he was avoiding sending me up there, "because of your mobility." I set him straight in no uncertain terms, and then we were fine. This experience, small in scale though it was, relatively speaking, made me think that people with visible differences are too often unfairly disadvantaged. Self advocacy skills for them are critical. Also, it must be true that I am often at fault, making assumptions and judgements in the same way, though meaning well. I will do better, I hope! 10) To be myself. Living in close quarters for extended periods means you can't pretend. Who you are is obvious to everyone, warts and all. Some will like you and some will not. Same for each of us. But we can all get along and get the job done with tolerance, cooperation and, when the goal is worth the effort, real collaboration. Thank you for taking this journey with me. Come sailing with me anytime!